Miko, or Shinto shrine maidens, can often be seen selling amulets, taking part in ceremonies, or swiftly moving from one building to another. Young, identically dressed women who once had important roles within the religion, but nowadays are generally just University students helping out on a part-time basis. Still, regardless of their status, or level of training, getting the chance for a quick portrait isn’t a common occurrence. At least not for me it isn’t, anyway. 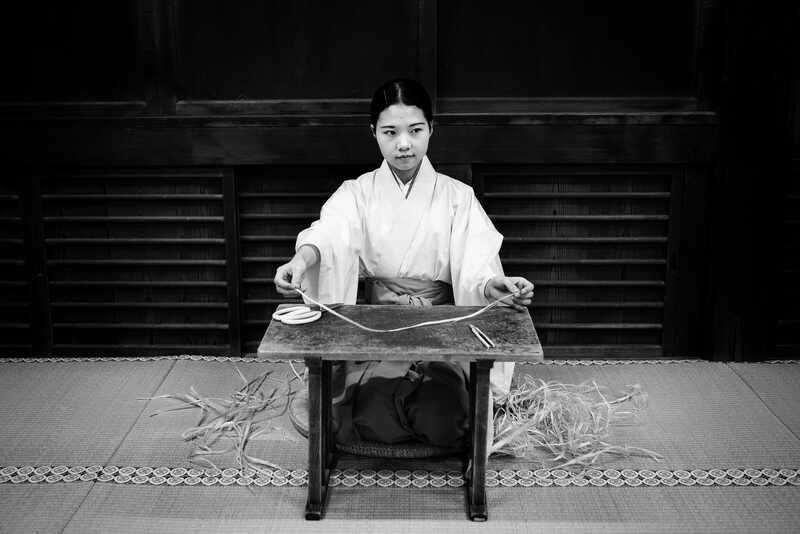 So here — in monochrome as it seemed best suited to the almost timeless nature of her position — is a rare photo of a Miko quietly going about her business. You are more than welcome. Very happy to have helped! @jenn, Exactly my reaction as well, it’s the sort of scene that makes you want to stop and do nothing, just enjoy the peace of the surroundings. Really nice to hear that aspect of the photo comes through. Cheers. Certainly nice to mix things up a bit, plus scenes like this don’t arrive all that often, so good to document them when they do. I too like the shots of tradition. I have scenes in my memory that you have given me of bonsai, archery and the shinto men. I know I’ll remember this, a Miko, something I was totally unaware of prior to your photo and explanation. Thanks Lee! You have enriched my life little by little. That’s nice to hear. Really nice indeed. Those scenes you mentioned I genuinely enjoyed shooting, so it’s great to hear that other people get some pleasure out of them too. this is a nice portrait, very inspiring. Thanks Olivier. Very happy to have got the photo. A scene I’d never seen before. Definitely a case of being at the right place at just the right time. There is something tranquil about quitely going about a simple task as well as you are able, and your photograph captures that feeling perfectly. Thanks for the background too. I have occasionally been confused between Miko and Maiko – and will probably still mix them up from time to time, but now I have less excuse to do do. You are welcome. Didn’t know much about them myself to be honest, so a good little learning exercise. Good to hear that tranquility comes through. Not always possible with a photo.